Twenty-five years ago a group of Unitarian Universalist leaders had a vision of our congregations living our values of interconnectedness and respect for the web of life. They formed the Seventh Principle Project, and in 1991 the Green Sanctuary Program was born, a program I am honored to manage today. We’ve come a long way since then. Over 250 Accredited congregations and six revisions to the program later, I want you to know what Green Sanctuary is becoming. Many misunderstand it as a curriculum or a static checklist of hurdles to “green” a church building. In fact, it is a guide for an entire congregation to move toward environmental justice and sustainability, from the sanctuary to the kitchen and classrooms, and out into the larger community. The program challenges congregations to understand environmental degradation as inextricably linked to racial and economic injustice. It helps congregations build their capacity to act as reliable partners to those who are most impacted, instead of trying to “fix” problems that exist or “rescue” people at the front lines of our climate crisis. Beyond one congregation working to get a certificate for their wall, this program empowers us to find the muscle to work together across congregations and faith communities. This week’s Climate Justice Month action is to sign the Interfaith Climate Change Statement, calling for world leaders to ratify and implement the Paris Agreement for global climate action. Green Sanctuary calls us to join together as part of a global interfaith community for climate justice. Rather than a Green Sanctuary Program for separate congregations, I imagine a Green Sanctuary Movement, united throughout Unitarian Universalism. If that image excites you too, help me make it real, help grow it! Email me to learn more about how your congregation can engage with the Green Sanctuary Program in new ways, or to join one of our brand new online Practitioners Networks for those who seek inspiration and connection with other UUs deepening their climate justice work both within and outside of congregations. Add your voice to the Interfaith Climate Change Statement as an individual or congregation. The statement will be presented officially to the President of the UN General Assembly on April 18, 2016. Get Inspired: Today is a Global Day of Prayer for Climate Action, with leadership from Evangelical Christian climate activists. Take time today to pray, light a chalice, listen to a song, or whatever helps you feel connected to our interconnected web of life. To share your prayers or read prayers from others, check out or post on social media with the hashtag #Pray4Climate. Get educated: Find out more about today’s Green Sanctuary Program via our online resources. Rev. 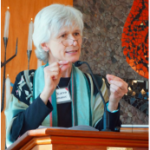 Karen Brammer is the Manager of the UUA Green Sanctuary Program.